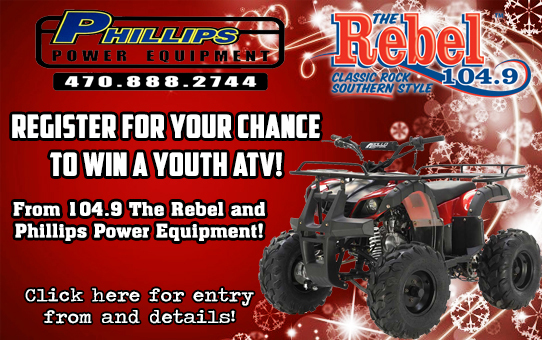 Just in time for Christmas 104.9 The Rebel and Phillips Power Equipment in Cartersville, are giving you a chance to win a TaoTao CC 125 Youth ATV! Imagine the smile on the face of your kids or grandkids Christmas morning when they find that beautiful red ATV that Santa left under the tree! For your chance win just register below between now and 12 A.M. December 19th. One winner will be chosen from all entries received on all participating stations on Wednesday December 19th. To see more just click on the image above. Merry Christmas from 104.9 The Rebel. Rome Radio Partners, LLC is not liable for any injuries or damages caused by the ATV. Actual prize pictured below form. Be sure to read 104.9 The Rebel's General Contest Rules before entering any contest. By entering in this contest you give permission to Rome Radio Partners, LLC. to share your contact information with third party advertisers.